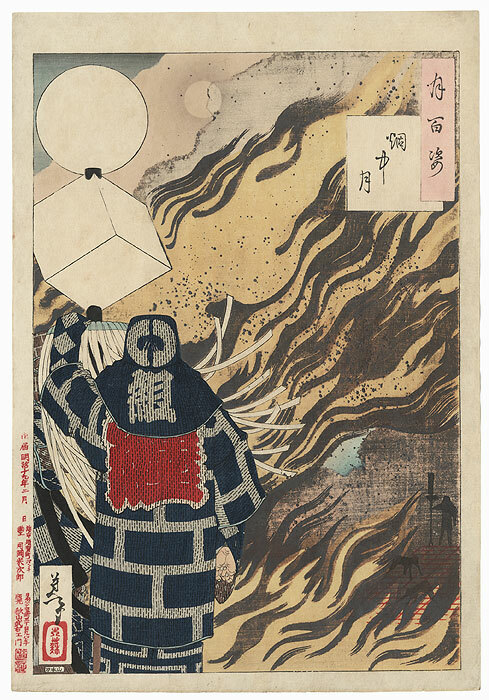 Moon and Smoke - Stunning Yoshitoshi design depicting a fireman holding a matoi or brigade standard as he watches flames engulfing the city. He stands calmly facing the raging fire, his duty as a standard-bearer for his company to wait atop a rooftop signaling the location of the fire to his men. The stitching on his quilted jacket is carefully detailed, and the robe bears the name of his company. Fires were common in the city due to the tightly packed wooden houses and buildings, and different brigades competed to extinguish blazes and receive rewards. The fire-fighting troops who fought these conflagrations were considered exciting and colorful characters and reached heroic status among the townspeople. 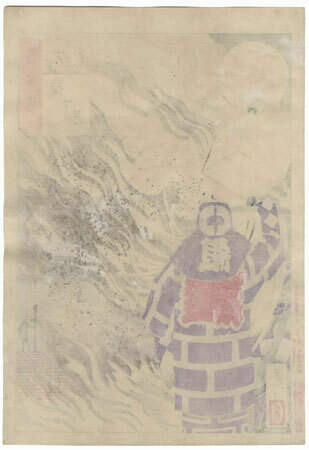 Here, Yoshitoshi depicts a quieter moment during the chaos. As the fire, smoke, and glowing embers drift across the scene, a standard-bearer for a rival brigade can be seen atop a distant roof at lower right. The full moon glows high in the night sky, echoing the circle atop the standard. 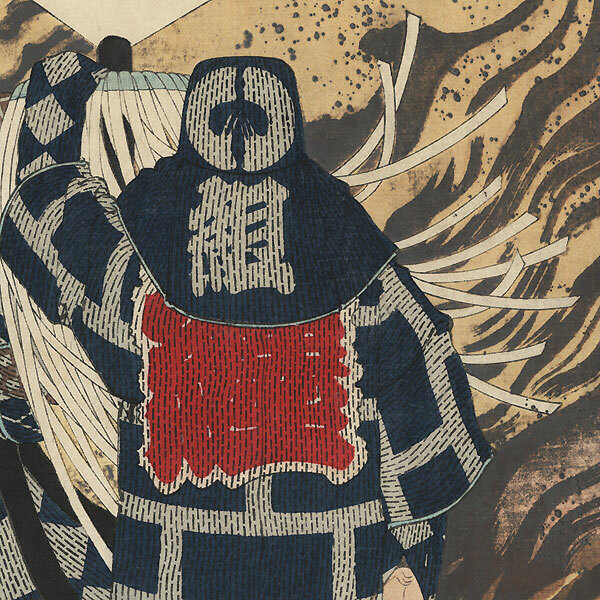 A fantastic design and one of the masterworks of Yoshitoshi's "Hundred Moon" series. Condition - This print with excellent color and detail as shown. Nicely printed and clean with full margins. Slight toning. Please see photos for details. Nice overall.